With the increasing abstraction of IT services beyond the traditional server room computing environments have evolved to be more efficient and also far more complex. Virtualization, mobile device technology, hosted infrastructure, Internet ubiquity and a host of other technologies are redefining the IT landscape. From a cybersecurity standpoint, the question is how to best to manage the growing complexity of environments and changes in network behavior with every introduction of new technology. In this blog, we’ll take a look at how anomaly detection-based systems are adding an invaluable weapon to Security Analysts’ arsenal in the battle against known – and unknown – security risks that threaten the stability of today’s complex enterprise environments. By continually analyzing traffic patterns at various intersections and time frames, performance and security baselines can be established, against which potential malicious activity is monitored and managed. But with large swathes of data traversing the average enterprise environment at any given moment, detecting abnormal network behavior can be difficult. 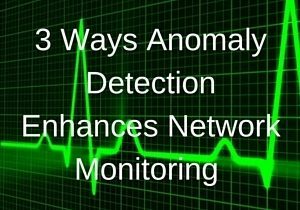 Through filtering techniques and algorithms based on live and historical data analysis, anomaly detection systems are capable of detecting even the most subtly crafted malicious software that may pose as normal network behavior. Also, anomaly-based systems employ machine-learning capabilities to learn about new traffic as it is introduced and provide greater context to how data traverses the wire, thus increasing its ability to identify security threats as they are introduced. Netflow is a popular tool used in the collection of network traffic for building accurate performance and cybersecurity baselines with which to establish normal network activity patterns from potentially alarming network behavior. An anomaly is defined as an action or event that is outside of the norm. But when a definition of what is normal is absent, loopholes can easily be exploited. This is often the case with signature-based detection systems that rely on a database of pre-determined virus signatures that are based on known threats. In the event of a new and yet unknown security threat, signature-based systems are only as effective as their ability to respond to, analyze and neutralize such new threats. Since signatures do work well against known attacks, they are by no means paralyzed against defending your network. Signature-based systems lack the flexibility of anomaly-based systems in the sense that they are incapable of detecting new threats. This is one of the reasons signature-based systems are typically complemented by some iteration of a flow based anomaly detection system. The chief strength behind anomaly detection systems is that they allow Network Operation Centers (NOCs) to adapt their security apparatus according to the demands of the day. With threats growing in number and sophistication, detection systems that can discover, learn about and provide preventative methodologies are the ideal tools with which to combat the cybersecurity threats of tomorrow. NetFlow Anomaly detection with automated diagnostics does exactly this by employing machine learning techniques to network threat detection and in so doing, automating much of the detection aspect of security management while allowing Security Analysts to focus on the prevention aspect in their ongoing endeavors to secure their information and technological investments.